Let’s be honest: On the whole, Sam Adams isn’t exactly known for the kinds of full-flavored, risk-taking beers that many other craft breweries are. Sure, there are the occasional exceptions like Utopias and the always-anticipated LongShot series, but in general, the majority of Sam Adams regular offerings are often thought of as gateway beers— those middle-ground beers that act as a corridor leading away from insipid mass-produced American lagers, and eventually onto more exotic and flavorful craft beers. When Sam Adams (Boston Beer Co.) was founded in 1984, there were fewer than 100 craft breweries in the U.S. That number has since skyrocketed and is likely to exceed 5,000 in 2017. Stakes and expectations rise with every new brewery as they continue to innovate with an eye towards pushing the boundaries of flavor, variety, quality and true-to-form interpretations of classic beer styles. And with craft beer now firmly established in the mainstream where the focus on flavor and stylistic excellence is the standard, the question arises: Should Sam Adams remain a gateway brewery? Granted, Sam Adams’ long-time play-it-safe strategy of cranking out relatively dialed-down, mild-mannered beers has brought it much success in the past. But since January of 2015, company share value has cratered by more than 50% in part due to increased competition and more choices especially from fuller-flavored breweries and expanding regional brands, in an overall slowdown of the craft market. 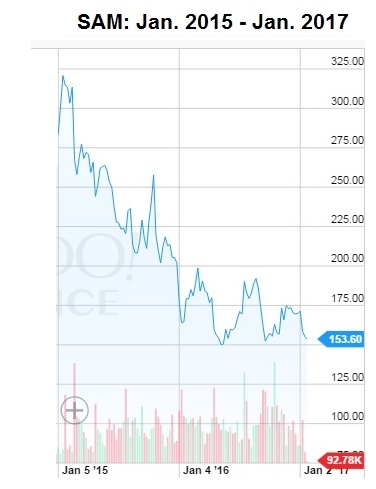 Revenue has also taken a hit from decreasing sales on the brewery’s flagship Sam Adams Boston Lager, not to mention investor fear of the aftermath of the recent AB InBev SAB Miller mega-merger, the beer world equivalent of having a red hotel on each property on about half of the monopoly gameboard. In the 1980s, it was easy to beat the likes of Bud/Miller/Coors (BMC) at the flavor game, and it still is. Even today, if faced with a hypothetical binary choice between a BMC or Sam Adams Boston Lager, I suspect the choice for the majority of craft beer drinkers would be Sam Adams. But nowadays, the reality is Sam Adams isn’t just competing with BMC, but often has a slew of other craft breweries to contend with on the tap list too. And that’s a battle that can only be won by fighting flavor with flavor. Certainly we can attribute many issues to the decline in revenue at the Boston Beer Co., one of which is the increased variety from other craft breweries. Sure, people are curious to try the newest thing from the latest brewery on the block, and this can siphon off business from Sam Adams to some extent. But this does not have to be a perennial problem because the truth is that great beer conquers all: if you produce a better, more flavorful beer, people will come back. In other words, control the controlables. Sam Adams has confronted the problem of ‘too much craft competitor choice’ in part with its variety 12-packs. But let’s not forget, this is 2017, not 1984 when most people had never heard of a Lambic, let alone a Gose. The more variety of beer in the marketplace, the more educated the beer drinker becomes. Dare I say that nowadays, you don’t have to be a beer aficionado to know what a really good example of any number of different beer styles should taste like. In other words, beer folks know that there are gold standards for beer styles like Double IPA (Pliny the Elder), Flanders Red (Rodenbach Grand Cru), and Gose (perhaps Ritterguts). But in many cases, the Sam Adams go-to strategy is to play the approachability card and produce a very light, vague interpretation of the style. When people have been exposed to full and vivid color, it’s difficult to go back to anything else. This is a good part of capitalism, at least for the consumer. It’s the result of competition in a free market forcing others to improve or stand aside. Of course, competition cuts both ways, and Sam Adams has the means and skill to become the gold standard of beer styles… if it wants to. Call it brewing “to-style”, or faithfully creating world class representations of classic beer styles, this key element may very well be the elusive “it” factor that gives rise to authenticity, the buzzword marketers have divined as the cypher to cracking the coveted millennial demographic. On one hand, authenticity can be the degree to which one is true to one’s own personality and spirit regardless of the outside world, and certainly Jim Koch, co-founder and Chairman of the Boston Beer Co., has been quoted as saying that the brewery doesn’t release a beer unless he likes it. On the other hand, we still have to face the fact that authenticity also has to do with staying true to the origin and attributes of whatever it is that is being produced, which in this case are particular beer styles that are labeled as such. Notice that “authenticity” in this sense is not merely a “millennial” or “hipster” sticking point, but rather a human one. Of course squaring personal authenticity with beer style authenticity becomes all the more complicated when you have shareholders to answer to, although it certainly helps to own all the shares that have voting rights, as Jim Koch does. Even though Koch is behind the wheel to a large extent and the shareholders are essentially just along for the ride, the traffic lights and sign posts of the market are still there whether you pay attention to them or not. But don’t let the smile fool you, recently minted billionaire Jim Koch is no novice when it comes to business. Having earned three degrees from Harvard including a BA, JD and MBA, and first cutting his teeth in the world of high finance before co-founding the Boston Beer Co. with other Harvard cohorts, Koch knows the simple rule of the jungle: adapt or get left behind. There are signs that Koch is adapting. 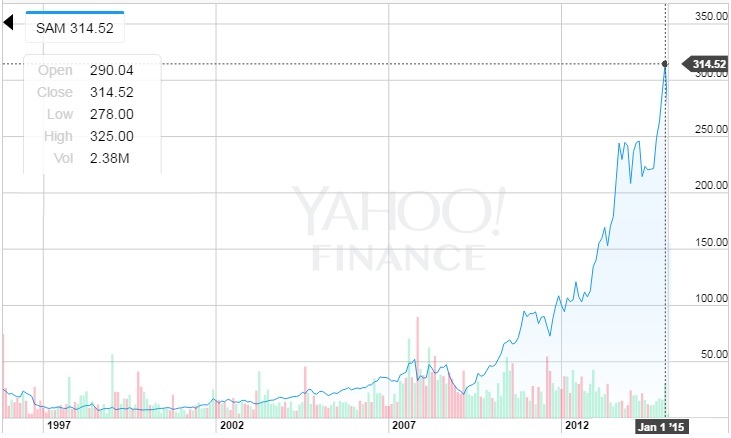 Sam Adams Turning the Corner? To be clear, the Boston Beer Co. is a giant in the craft beer industry, second only to Yuengling in beer sales volume. Unlike Yuengling however, the Boston Beer Co. is one of the few craft breweries to have distribution in all 50 states, including a fairly broad international presence. That’s a big advantage. Not only this, but because of Sam Adams’ size, it can also out-compete most competitors on price. The brewery has also diversified with their Angry Orchard, Coney Island, Traveler, and Truly Spiked & Sparkling brands with mixed results. Also in Sam Adams’ corner is the brewery’s “story”, a critical feature we might recall from marketing 101. The Sam Adams story is simple, short and powerful: Jim Koch was one of the founders of the craft beer revolution, and uses the historical American revolutionary with brewing ties Sam Adams as the figurative image of that story. Like the American revolutionaries, the Boston Beer Co. was one of the first to stick its neck out to oppose an oppressive controlling force (BMC), in order to give folks freedom to choose something different. Something more interesting and enriching. A better life. Many craft beer drinkers owe their introduction to craft beer directly to Sam Adams as a gateway brewery, or at least understand Sam Adams’ part as a forefather of the craft beer revolution and therefore share a connection to the brewery, if not a debt of gratitude. That’s a tough story to beat. And the “Revolutionary” theme is one Sam Adams continues to get mileage out of with its recent 2014 Rebel IPA offering. Despite his reluctance to go along with the mainstream and produce an IPA, Koch did it. Yes, many reviews point out that the beer was toned down for those familiar with big, bitter West Coast American IPAs, but it was regarded as flavorful nonetheless. But is it “authentic” for Koch to end up jumping on the IPA bandwagon despite his reluctance to do so? To the extent that he made an IPA that he was happy with, yes. Will it satisfy all IPA fans? No. But this was Koch’s compromise. And a sign of personal growth that bought the brewery some time to right the ship. More signs of change include a recently completed bold re-imagining of Sam Adams packaging. But a packaging facelift only gets you so far. The proof of real change is what lies underneath the bottle cap. And from what we can tell from Sam Adams’ recent Brewnited Variety Pack, real positive change is happening. 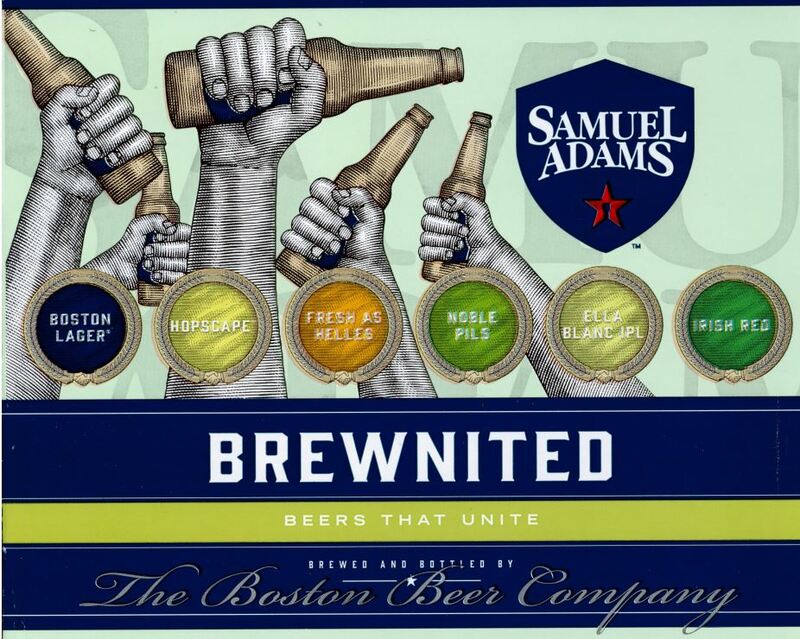 Delivering in many cases with creative, intriguing, balanced, bold and clean flavors, Sam Adams Brewnited Variety Pack has listened to the market and responded with vigor. Noteworthy were the Ella Blanc IPL, Fresh as Helles, and Hopscape. The Irish Red is to-style, but could do with a bit more oomph. Of course a few new interesting and flavorful brews does not a trend make. But all of these points combined pale in comparison to something Koch did in January, 2017. 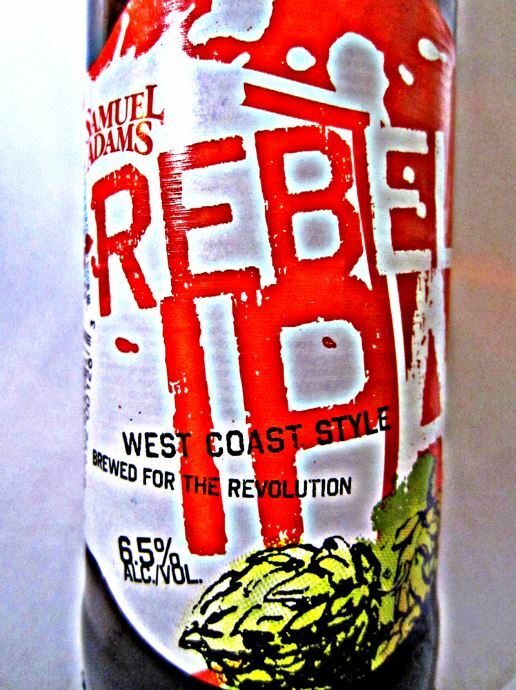 Perhaps the greatest sign of change at Sam Adams occurred on January 19, 2017 when a press release from the brewery hit the wire indicating that it has reformulated its Rebel IPA with new and experimental hop varieties. Significantly changing the recipe for a flagship beer is unprecedented in the brewer’s 32-year history. Some might be quick to brush this off as a sign of desperation on the part of Sam Adams, but those who know better should see this as an absolute departure from predictable old Sam Adams— a departure that could spell trouble for other craft breweries, and big profit for the Boston Beer Co. Predictable old Sam Adams would have kept the same core brands (seasonals included) as is, never tweaked any recipes, never changed, and continued to set a baseline for every other craft brewery to beat. But now that Sam Adams has signaled that it could change one flagship beer to adapt to market tastes, who’s to say that at any moment, it might not change another? What if Sam Adams re-works even more of their brands, adding extra oomph to them so that they are as flavorful or more so that some of the best examples of that beer style on the market? Is there any doubt that the collective talent at Sam Adams would not be able to produce world class examples of any given beer style if they so choose? And if Sam Adams went toe-to-toe on flavor, creativity and stylistic integrity with the Russian Rivers, Trilliums, or 3 Floyds of the craft beer world, at what point would craft beer fans opt to pay $15 for a variety 12-pack of Sam Adams versus $10 for a 4 or 6-pack of xyz brewery? If Sam Adams did produce equal or superior examples of classic beer styles, at what point does “drink local” give way to “better bang for the buck”? With shrinking beer SKUs on retailers’ shelves, the perfect storm for Sam Adams may just be brewing. Make no mistake: The Boston Beer Co. is a bear and has the passion, talent and pockets to lead in craft beer again. The bear’s eyes are starting to open. Perhaps it just needs a little poke.